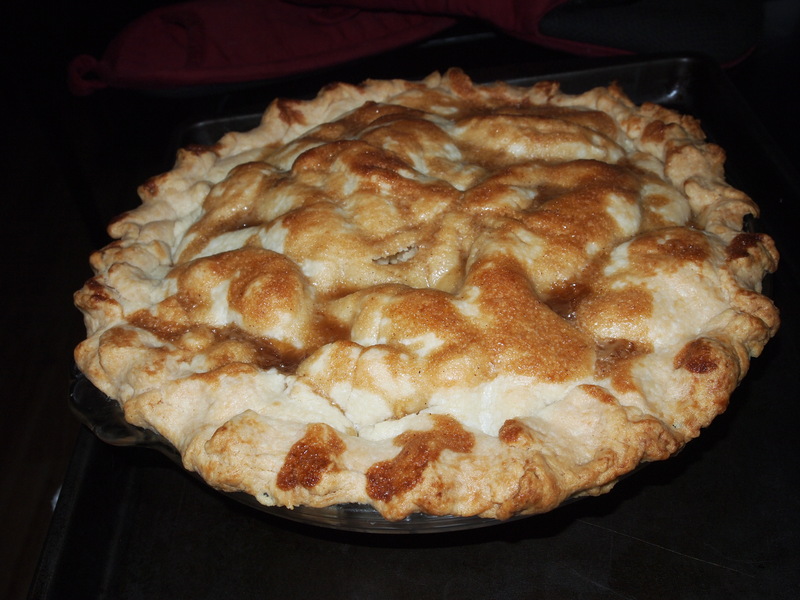 In 2010, when I was still blogging on a now defunct blog over at WordPress, I wrote a post about my favorite apple pie recipe. A friend of mine, also named Adrienne (we spell it differently) loved the recipe so much she begged me to find it for her this year after a tech snafu that caused her to lose the link. So, I figured I would add it to my current blog (even though I'm terrible about updating) so I could find it easier. A lot of women can ask their mom or grandma for a trusty pie recipe, however my grandma is not really known as a cook. She can get along all right in the kitchen, but she will be the first person to let you know she isn’t very good. Instead of asking my own grandma for her apple pie recipe (because she doesn’t have one) I looked to allrecipes.com for a yummy apple pie recipe. One of the first recipes I looked at was Grandma Ople’s apple pie. It looked easy enough and had delicious ingredients, so I decided to give it a try. I followed the recipe very closely, only adding a little cinnamon, and using trader Joe’s frozen pie crust, even making the lattice top crust. The pie was amazing. I mean melt in your mouth, buttery perfection. I have never had an apple pie that delicious. The only bad thing was it wasn’t very pretty with the lumpy lattice top. I made the pie again for a pre-Thanksgiving dinner party I was attending, and decided to use a full crust this time. It turned out even better this time around, and I got so many wonderfully sweet comments on how yummy it was! The other day, my friend Adrienne asked for apple pie recipes, and of course I had to offer her Grandma Ople’s recipe! I don’t know who Grandma Ople is, but I just want to hug and kiss her for creating this wonderful recipe! I am giving you the recipe with my own little additions and changes so you can try it for yourself! 1. Preheat oven to 425 degrees. Melt the butter in a saucepan. Stir in flour to form a paste. 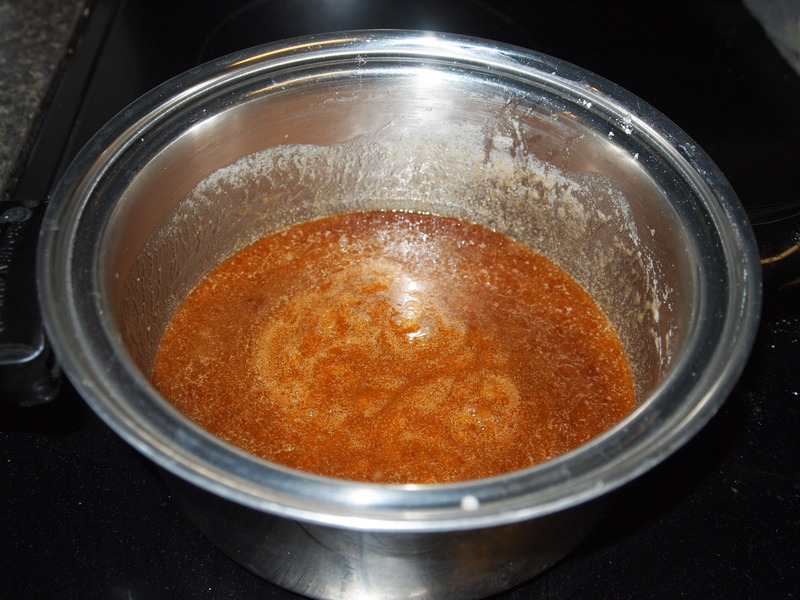 Add water, cinnamon, white sugar and brown sugar, and bring to a boil. Reduce temperature and let simmer for 5 minutes. 2. Place the bottom crust in your pan. Bake at 425 for 10 minutes, remove and let cool for a few minutes. 3. In a separate bowl, pour sugar and butter mixture over apples, saving just a little of the mix for the top crust. 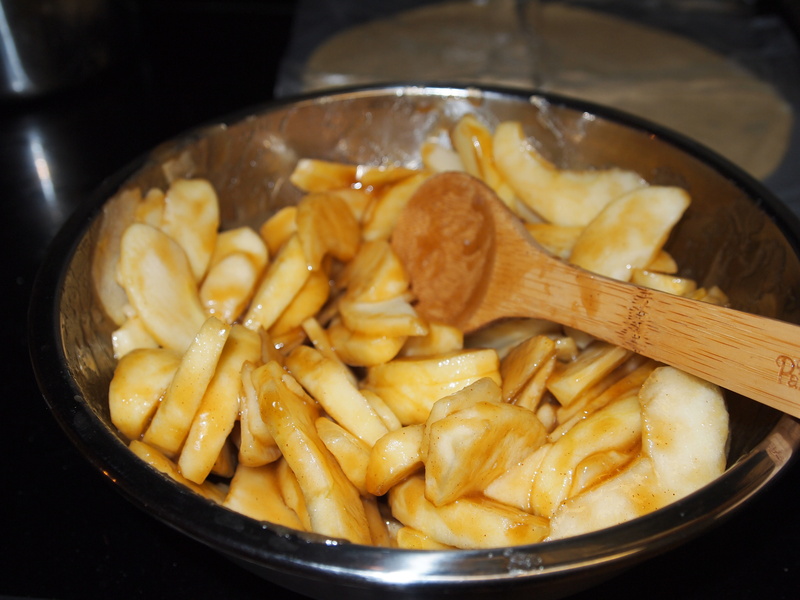 Toss to coat, then fill pie crust with apples, mounding slightly. 4. Cover with full crust and paint with leftover sugar mixture. 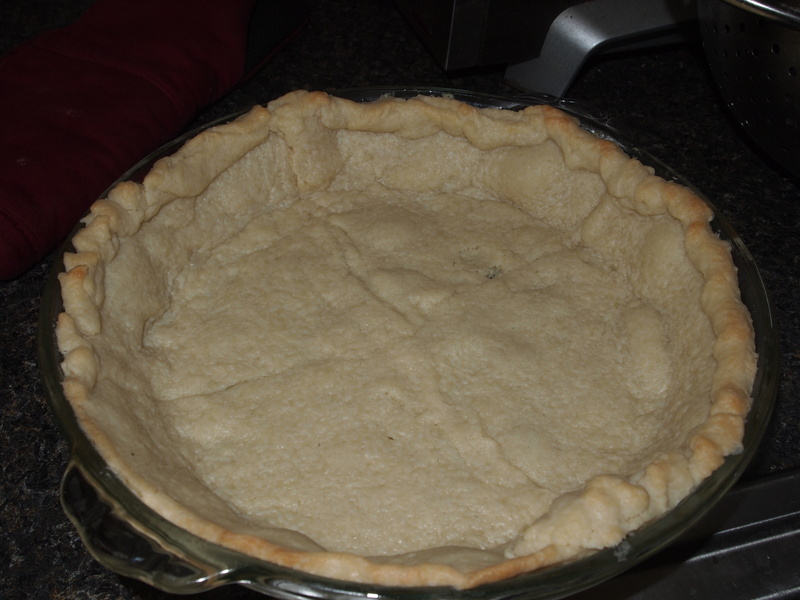 Pinch both crusts together, making a pattern if you want all the way around the pie. 5. Bake 15 minutes in the preheated oven. 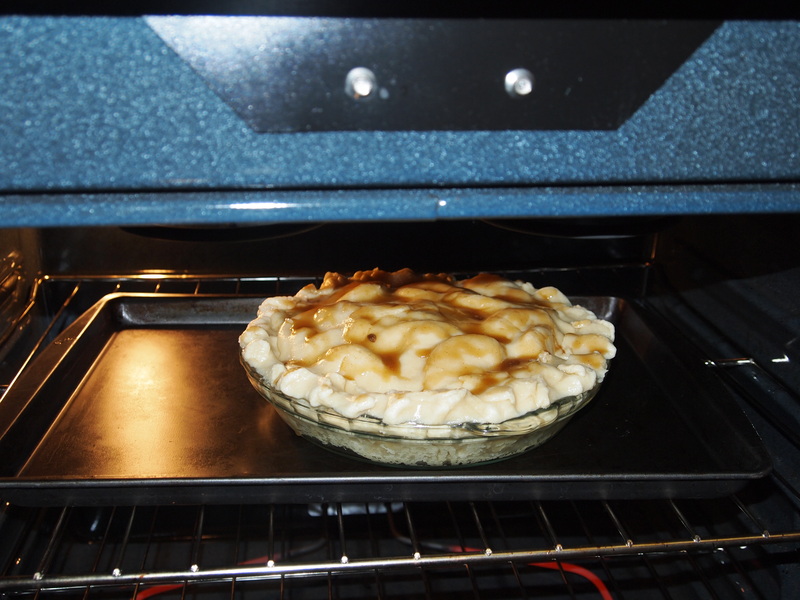 Reduce the temperature to 350 degrees F. Continue baking for 35 to 45 minutes, until apples are soft. Remove, let cool and enjoy!! Let me know if you use this pie recipe, I want to see if you make any adjustments and what you think! I make this pie for both mine and Justin's family every year for both Thanksgiving and Christmas (that's 4 total every year) and they all go nuts for it! Best apple pie recipe ever.